Perso Kebab uses their own specialised couriers to deliver their food. Turkish bread, sheared sliced chicken, lettuce, onion, tomato, choice of sauce (Garlic, Chilli, Sweet Chilli, Tomato, BBQ). Turkish bread, falafel, lettuce, onion, tomato, hummus, tabouli, choice of sauce (Garlic, Chilli, Sweet Chilli, Tomato, BBQ). Turkish bread, sheared sliced lamb, lettuce, onion, tomato, choice of sauce (Garlic, Chilli, Sweet Chilli, Tomato, BBQ). Turkish bread, mix of sheared sliced chicken and lamb, lettuce, onion, tomato, choice of sauce (Garlic, Chilli, Sweet Chilli, Tomato, BBQ). Turkish bread, lamb pieces, lettuce, onion, tomato, choice of sauce (Garlic, Chilli, Sweet Chilli, Tomato, BBQ). Turkish bread, chicken pieces, lettuce, onion, tomato, choice of sauce (Garlic, Chilli, Sweet Chilli, Tomato, BBQ). 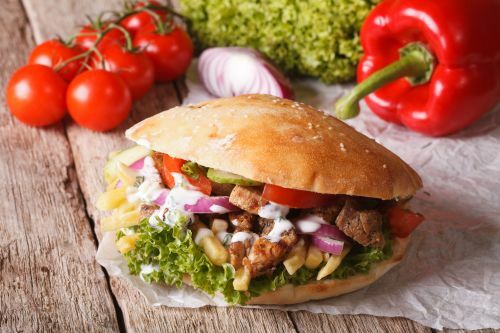 Turkish bread, adana (mince meat mixed with special spicy herbs), lettuce, onion, tomato, choice of sauce (Garlic, Chilli, Sweet Chilli, Tomato, BBQ). Chips, cheese, choice of lamb, chicken or mix sheared meat, choice of sauce (Garlic, Chilli, BBQ). Grass fed beef, lettuce, onion, tomato, pickles, tender cheese, tomato sauce, perso sauce. Grass fed beef, lettuce, onion, tomato, pickles, tender cheese, tomato sauce, perso hot sauce. Crispy chicken breast, lettuce, onion, tomato, pickles, tender cheese, avocado, perso sauce. Double grass fed beef, lettuce, onion, tomato, pickles, tender cheese, tomato sauce, perso sauce. Crispy chicken breast, lettuce, onion, tomato, pickles, tender cheese, sweet mustard, perso sauce. Sheared lamb, mix salads, two choice of dips (Capsicum, Cucumber, Chilli, Hummus), choice of rice and bread. Sheared chicken, mix salads, two choice of dips (Capsicum, Cucumber, Chilli, Hummus), choice of rice and bread. Combination of sheared lamb and chicken, mix salads, two choice of dips (Capsicum, Cucumber, Chilli, Hummus), choice of rice and bread. Lamb pieces, mix salads, two choice of dips (Capsicum, Cucumber, Chilli, Hummus), choice of rice, bread, grilled tomato and hot chilli. Chicken pieces, mix salads, two choice of dips (Capsicum, Cucumber, Chilli, Hummus), choice of rice, bread, grilled tomato and hot chilli. Mix of chicken and lamb pieces, mix salads, two choice of dips (Capsicum, Cucumber, Chilli, Hummus), choice of rice, bread, grilled tomato and hot chilli. Adana (mince meat mixed with special spicy herbs), mix salads, two choice of dips (Capsicum, Cucumber, Chilli, Hummus), choice of rice, bread, grilled tomato and hot chilli. Mix of adana, chicken and lamb pieces, mix salads, two choice of dips (Capsicum, Cucumber, Chilli, Hummus), choice of rice, grilled tomato and hot chilli and bread. Capsicum, hummus, mousir, cacik, acil (hot and spicy), beetroot.